We're but 2 days away from the launch of Flockers as a full game. It's been a hell of a journey through Early Access - together we've slain bugs, tweaked features and saved countless scores of sheep from their horrible, weaponised fate created by the Worms. ...we've also accidentally led countless scores more to their doom, but let's gloss over that minor hiccup. We can't thank everyone who took part in our Early Access enough. Ewe've* been excellent. The feedback you have given us has helped us to make a really great game that is already getting brilliant reviews, both by players and the games press. As small thanks, we've uploaded the release version of Flockers to Steam today. Anyone with Early Access can play the full Flockers experience 2 days before general release. 1 New Bonus Level to unlock! More Rewards available to unlock! Made optimisations to min spec graphics cards – Flockers can now support Nvidia GeForce 8600 GS/AMD Radeon HD 4650 and equivalent. Over the next 2 days, we'll also be removing all the developer scores from the in-game leaderboards. Your scores will remain, and this is your chance to set the bar for the influx of new players heading to Flockers over the coming months. Do us proud, make them work for the top spot. It's not all in-game though. We need your Meat Maker levels, your Guides, your Reviews and Discussions to help make the Flockers community an amazing place to be. I'll be highlighting the very best of your creations; in the forums, on Twitter, Facebook and here within Team17 too - we all can't wait to see what you can make! 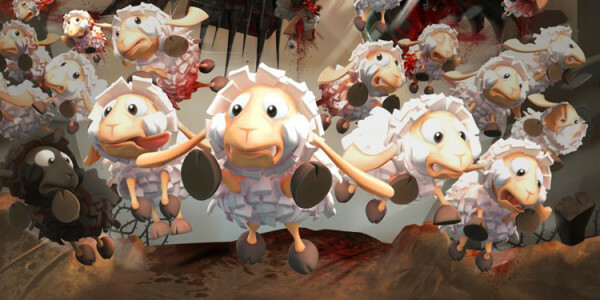 From everyone here at Team17, thank ewe** for saving our sheep. *That's the last time I'll do that during early access, I promise.